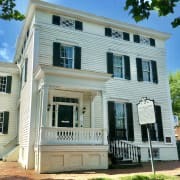 The Lee-Fendall House Museum is looking for volunteers to research collection objects at this historic house museum in support of its mission of serving as a historic, cultural, and educational resource for the community. Develop a solid knowledge of the museum, its history, and the collection in order to maximize research efforts. Conduct research on historic objects within the collection as directed. Make changes/additions to PastPerfect collections management database as directed. Ensure the safety and security of the collection, and follow best practices when moving or handling objects. Attend training as scheduled by the museum staff. May provide other collections assistance as needed, such as routine inventory and cleaning. Must enjoy working in a museum setting. Research experience is required, as well as knowledge of history or art history. Experience working with museum collections is preferred, but not required. Volunteers are expected to work a minimum of 6-10 hours per month. Hours and schedule are self-determined but time spent researching at the museum must occur within the museum’s normal hours of operation: Wednesday through Saturday, 10 AM-4 PM or Sunday from 1-4PM. Training and guidance will be provided by museum staff, with a special emphasis on collections handling. Research guidelines and research report templates are provided upon start date. Access to free wi-fi is available at the museum but volunteers are expected to bring their own phone, tablet, or laptop if performing internet research on-site. Free admission to the museum and special tours. Free admission to many regional museums and historic sites. Must use own laptop or device to perform internet research.